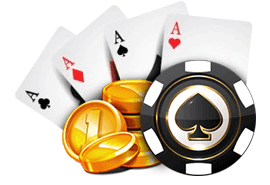 Fold equity in poker is quite simply a way of talking about how often your opponent will fold when your bet. For example, someone might say, “my bet is profitable because I am capitalizing on fold equity”. You can apply fold equity to any bet in poker, whether it be preflop, on the flop, the turn or the river! Every bet in poker has a perceived amount of fold equity based on how often your opponent will fold, as you get better at poker you will learn of different ways to quantify and maximize fold equity. The profitability of any bet is made up by your perceived fold equity combined with your pot equity (Percentage share you have of winning the pot at that moment). The more fold equity you have the less pot equity you need for your bet to be profitable. Inversely, the more pot equity you have the less fold equity you need for your bet to be profitable. The reason why semi bluffing in poker is profitable is because you capitalize on your fold equity and combine it with your pot equity. One key way to quantify how much fold equity you have is by looking at and understanding your opponents poker tracker statistics. Remember, when using any stats for making a decision in poker, make sure you have a large enough sample of hands. The profitability of a preflop steal from late position can be figured out by looking at your opponents defend rate from the small and big blind. Or even simpler, by looking at there VPIP/PFR and 3-bet percentage you can get a basic idea how often your opponent will fold, call or raise your steal. The profitability of a preflop 3-bet and 4-bet can be figured out by looking at your opponents fold to 3-bet/4-bet percentage from that position. The profitability of a continuation bet can be figured out by your opponents fold to continuation bet percentage. The profitability of your double barrel/triple barrel can be figured out by your opponents fold to turn/river bet percentage. Remember, nothing is static in poker so fold equity can be increased or decreased based on almost everything. For example, the turn and river cards can greatly increase or decrease your fold equity. Good turn cards such as over cards are great to double barrel as the preflop raiser. However, cards pairing any card on board are bad to double barrel and decrease your fold equity. On the flop, the texture of the board combined with your opponents fold to continuation bet percentage will be a good gauge of how profitable your bet will be. For example, wet co-ordinated flops you tend to have less fold equity when you bet because the board is more co-ordinated and easier to hit with any two cards. Your own statistics and image also effect your fold equity. Remember the looser you play the more action you are likely to receive from your opponents. This is a very simple to understand, the more hands you play, the less likely you are to make a strong hand and the less likely your opponents are going to believe your bets. Say someone is raising 100% of hands, there bets are going to get alot less respect than from someone raising 15% of hands.